As residents of northern Michigan know, a beach along one of the Great Lakes is a great place to go if you want to escape the summer heat. In addition to swimming, the refreshing breezes often present at the lake shore help to provide relief from the heat. In the summer, it is not uncommon for temperatures at the lake shore to be around 80, while temperatures farther inland soar into the 90s. We can thank "lake breezes" for these cooler temperatures. Lake breezes develop when the land becomes warmer than the water. The warm air over land rises, and gets replaced by the relatively cool air which resides immediately above the lake surface. You can tell when a lake breeze forms when the wind abruptly becomes "onshore" (blowing from the water toward the shore). Lake breezes generally form several hours after sunrise, and have speeds of around 10 mph. Lake breezes generally dissipate in the early evening as the sun begins to set. The spring and summer are the most common times of year for lake breezes. Lake breezes can impact the weather in many ways. In addition to shifting the wind and cooling the temperature, under certain conditions lake breezes can help to initiate thunderstorms. 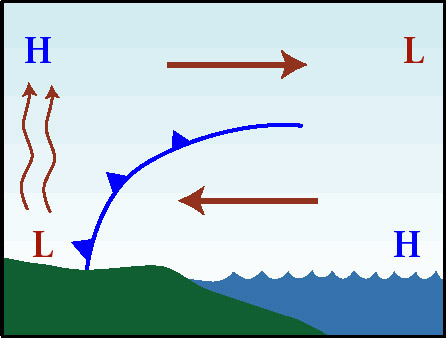 Lake breezes are also responsible to keeping lake shores less cloudy, due to the fact that the cooler air found in a lake breeze tends to rise into cloud cover less readily. How does the National Weather Service forecast lake breezes? National Weather Service (NWS) meteorologists consider many factors when predicting lake breezes. Two of the main considerations include: 1) the difference between the air temperature and water temperature, and 2) the wind speed. In general, lake breezes are more likely if the temperature difference between land and water is large, and the prevailing wind speed is light. In the spring, air temperatures in the 40s and water temperatures in the 30s can lead to lake breezes. In the summer, air temperatures in the 80s and water temperatures in the 60s can help promote lake breezes. The prevailing wind speed also helps determine if a lake breeze will form. If winds are too strong (especially if they are offshore) then lake breezes are less likely to form. On the other hand, when the prevailing wind speed is light, then lake breezes are more easily formed.